GayLea's 24 Days of Cookies Giveaway is back! At the link below, enter each day by opening a new door to review a holiday cookie, each door earns you an entry into the grand prize draw! 1. Open a new door each day to reveal a holiday cookie. Each door opened earns you one ballot toward our grand prize. 2. Click again for the recipe and a virtual cookie. Eat the virtual cookie! Or, in the spirit of giving, send it to a friend on Facebook. Have fun personalizing a message with our gift tags. 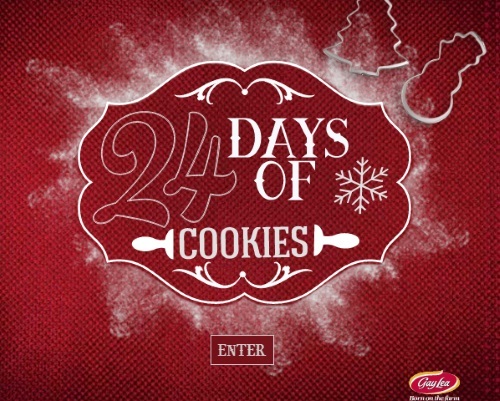 3.Whether you eat your cookie or give it away, you’re entered in a draw to win a real batch of the day’s cookie. We’ll send the cookies, freshly baked, to the winner’s door. 4. Miss a day? Unfortunately, each door locks after 24 hours, so you won’t get a ballot. However, you can still access any recipe once it has been revealed. 5. We’ll alert the daily and grand prize winners via email. Good Luck! You can enter everyday for the best chances! Contest closes December 24, 2016 Excludes Quebec.